It has been more than 3 years since I first started wearing the full set of Nefful clothing in March 2009. Many of my friends and customers had asked me how did I maintain my Nefful clothing, and still able to wear it 24hours a day for the past 3 years. Previously I shared about my full set of Nefful clothing that I have. Below is my secret that I am going to share with you in more detail, which I always share with my friend and customers. What do I use to clean these wonderful negative ions attracting Nefful clothing? As you can see I have 5 different laundry nets, each for different category of clothing. I would separate the dark from the light so that the white will remain white or even more white than before. When I wash I would separately wash them too. Especially when all my socks are dark coloured so I washed them separately. I use the Nefful Natural Detergent as its made from natural ingredient and it environmentally friendly. The most important thing about cleaning the Nefful clothing is using the Washing laundry net in the washing machine to protect the clothing. a. using hand wash will dry our hands due to the detergent, it may even affect our skins if detergent is not wash off our hands properly. b. using hand wash will damage the fabric when the fabric is twisted to rinse off the water. Especially when I applied too much strength. c. using hand wash actually waste more water, sometimes the rinse is not enough to remove the detergent from the clothing. 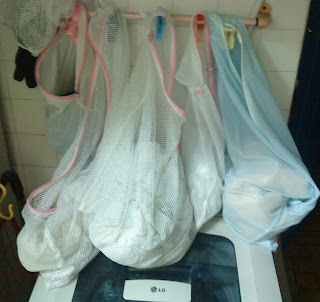 d. I have too many Nefful clothing to wash daily, so washing machine is my best option and it is cleaner and makes them fresh and dry quicker indoor. Thus I urge you to consider using washing machine to wash your Nefful clothing, please remember to use the washing laundry net. With that I am going to leave you some other tips on washing your clothes from an article i read on Yahoo website. Enjoy. The average family spends just under $2,000 per year on clothes. Considering that the average household throws away around 68 pounds of clothes and textiles each year, one of the easiest ways to save money on clothes is to not have to buy new clothes on a regular basis. But how can you make sure your clothes last as long as possible? Here are eight ways to make your clothes last longer. Always separate your colors when you wash and be sure to use cold water. Air-dry delicate clothing items and use mesh bags to protect your delicate in the wash. Make sure all your jackets and jeans are zipped prior to throwing them in the wash and be sure to fasten your bras so the hooks don't catch on anything. Also, try to launder less by taking advantage of lint rollers and spot removing pens. After you do your laundry, make sure you put your clothes away properly. This means fold the clothes that are meant to be folded and hang the clothes that are meant to be hung. Also, when dealing with seasonal clothes, be sure to store clothes in a manner that doesn't allow bugs or moisture to wreak havoc on them. Don't let stains sit. The longer they sit, the harder it is to get them out. Also, blot stains as opposed to rubbing them. Rubbing stains will destroy the fibers in your clothes, making it so the clothes don't last as long. If you are going for a run, wear running clothes. If you are cleaning or working outside, wear clothes that are old and you can get dirty. Dress according to the situation you will be in. If you are going to eat a potentially messy meal or know you are klutzy and consequently have a high chance of spilling your morning coffee all over your pants, opt for clothes that are darker in color or match the color of the potential spill. Dark colors are great at hiding stains. If an article of clothing gets a hole or the hem starts to come undone, fix it immediately before the problem gets worse. By immediately fixing any issues with your clothes, they will last longer. Be careful around any objects that may cause damage to your clothes. These can include plants with thorns, exposed nails, and other surfaces that are rough or may snag your clothes. Try to steer clear of these potential "damagers" so that they don't wreak havoc on your clothes. Different fabrics and materials need different types of care. Always read the washing and care instructions on your clothes so you know how to best clean and iron them. If you purchased clothing online, make sure to bookmark the product page so you can return later to read the care instructions. Most of the time it's easier and faster to just rip the tags off new clothes. This strategy is not always a good one when it comes to maintaining the lifespan of your clothes. Take the time to find a pair of scissors when removing the price tags (and any other tags) off your clothes. Ashley Jacobs is a college finance columnist for personal finance blog Wise Bread. Follow her latest tweets on @WiseBread.